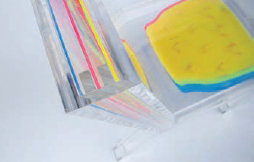 From pens to building of houses, plastics are unmatched in versatility, cost-effectiveness and designerfriendly edge, says Angelica Buan in this report. Greenhouse gas emissions, flooding, and marine litter – these are just a few of the issues that are making fossil fuel-based plastics infamous. The US leads in completely phasing out microbeads in personal care products by 2017. Lightweight plastic bags are seeing the inevitable with phase out policies being enforced in many countries worldwide. Europe, where disposal of single-use plastic bags is estimated at up to 200 bags/person/year, has initiated an EU-wide legislation that aims to reduce the use of conventional single-use carrier bags via the amended Packaging and Packaging Waste Directive (PPWD). The law directs EU member states to introduce measures that cut down lightweight plastic bag use to 90 bags/person by end of 2019; and 40 bags/person/year by 2025. Plastics, owing to their versatility, are essential to transportation, safety, security, health, shelter, communication, entertainment and the innovations of various industries, the US-based Plastics Industry Trade Association (SPI) states in its website. The benefits of using plastics are oft-said and almost countless. But to cite a few, plastics contribute to energy efficiency and possess properties that promote durability, longevity and performance of products. Plastics, amid the bad critique they are getting, remain a ubiquitous material in our daily lives and are far from being retrenched. According to a 2014 Sales and Captive Use by Major Market report from the American Chemistry Council (ACC) LDPE, LLDPE, HDPE, PP, PS, EPS and PVC resins are not just utilised for packaging, although this application merits the larger use for plastics (34%). Other markets continue to account for the use and sales of plastics, with consumer & institutional, and building & construction markets at the top range with 20% and 16% shares, respectively; and the industrial machinery markets clinching 1% share. Meanwhile, distribution percentage for the furnishing & furniture, as well as electrical and electronics segments is at 2%. And the more our lifestyles advance, the more we will see plastics being integrated into the objects and products we use on a regular basis. 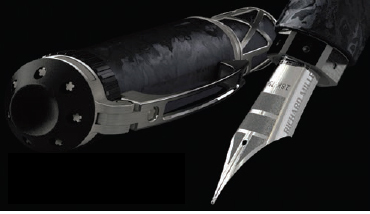 Luxury Swiss watchmaker Richard Mille introduced a carbon fibre-based RMS05, a mechanical pen that uses watchmaking technology to deploy the nib. The carbon-based material for the pen, the North Thin Ply Technology (NTPT), was introduced by Richard Mille for his timepieces in 2013. The composite material is light yet rigid. The barrel and cap of the pen is made of NTPT, has “remarkable surface that displays extremely regular undulations”. This is because NTPT carbon is composed of thousand layers (having a maximum thickness of 30 microns) of parallel laments obtained by dividing carbon fibres. The layers are impregnated with resin then woven on a special machine that modifies the direction of the weft by 45 degrees between layers, creating this distinctive visual effect. Heated to 120°C at a pressure of six bars, the material is proccessed on a CNC machine. Battery-less phony phone – It’s called NoPhone, a non-electronic, non-functioning and featureless hand-held piece of plastic that imitates a smart phone in terms of weight, dimension and appearance. Created by a company also called NoPhone, the flagship product, as the name suggests, is just a “plastic slab” that aims to replace a real phone but does not do anything – not even call, send messages, take selfie shots, or access the Wi-Fi. Priced ranging from US$5 and US$65, depending on the “model” and “plans”, No Phone is, at least, water-resistant (because it is made of plastic!) and requires no charging. The creators of NoPhone say that the product’s concept is beyond mere gimmickry. “NoPhone is a satirical security blanket of sorts, meant to comment on our present addiction to technology." say the creators of the gadget. Ultimately, it is meant to allow a user to take a break from his or her mobile phone life, once in a while. Chairs that unseat traditional materials – South Korean industrial designer Sohyun Yun designed a clear plastic chair with slots for inserting decorated sheets to personalise the piece. A chair-cumcreative canvas, Sohyun’s Layer is a customised chair, made of clear acrylic frame and panel. With the plain frames slotted at the back rest and seat, the intention of the designer is to allow the user to self express by inserting his/her design of choice (printed on sheets of plastic, glass, or any material) into the frame. Meanwhile, Hungarian designer Demeter Fogarasi, also created a chair combining biodegradable plastic (PLA) and natural textiles. It is heat-pressed to form a composite material that is reheated and shaped until it cools and sets firm. To create the seat of the chair, Fogarasi used a mould, which rests on a tubular steel framework. It is meant to look like a frozen windswept sheet of fabric. With this design, Fogarasi said that his aim was to make a composite material that not only possessed good technical properties but also emphasised naturalness. 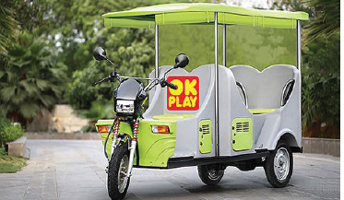 Plastic on wheels – The common rickshaw, a three-wheeler urban vehicle that is popular in India, is getting a “greener” spin with a rotomoulded plastics version from OK Play India. The New Delhi-headquartered automotive plastic products manufacturer aims to break into the automobile industry with its environment-friendly, zero-pollution E-Raaja. It will produce in its two plants located in Haryana and Tamil Nadu that have a production capacity of 300,000 e-rickshaws/year. Unveiled late last year, E-Raaja has been approved by the automotive testing and R&D centre, International Centre for Automotive Technology (ICAT). 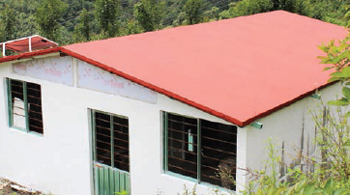 Raising the roof of plastic homes – Mexicobased company, EcoDomum, has developed low-cost walls and roof panels using waste plastic materials. It recycles about 5.5 tonnes of waste plastics that vary from soda bottles to old toys that are cut, melted and processed through a hydraulic press to produce the panels. EcoDomum also offers a housing subsidy programme through which families are required to pay only about US$280 for a 430-sq ft home. A low-cost home uses around 80 pieces of plastic panels - about 2 tonnes of plastic wastes - and takes approximately a week to build.